Looking through the open cockpit door as I boarded a Southwest flight, I noticed the pilot and copilot huddled over a clipboard. I had plenty of time to watch; a delay in boarding caused by a passenger trying to shove a steamer trunk into an overhead bin caused our line to grind to a halt. Standing in the doorway, I listened as the pilot called off an instrument setting to the copilot and heard his clear response; “Check.” They seemed engrossed in completing the pre-flight checklist, which made this nervous flyer very happy. When it comes to safety—especially my own—I want no steps left out. Nor did I want them to rely on their memory. I want to see pen on paper, or clicks on a computer, documenting each critical step being asked, answered and most of all, completed. Being in healthcare, you’d think we’re used to checklists like those of the Southwest pilots. Unfortunately, medical care has yet to fully embrace this seemingly simple concept. Atul Gawande, MD speaks and writes about this very subject, that he highlights in his best–seller, “The Checklist Manifesto: How to Get Things Right.” Writing of his experience with surgical checklists—steps taken ensuring that critical elements of the surgical process are not left out, like operating on the right patient, or operating on the right part of the right patient—and it’s ability to save lives. Having a list, checking it twice led to reductions in death rates, complication rates, surgical site infections, and unplanned reoperations. And if that’s not reason enough, hospitals and surgeons using checklists might even get sued less often. So what’s the deal? Not enough pens and paper? It seems when it comes to patient safety, tradition trumps good judgement. Dr. Gawande speaks of surgeons unwilling to carry out checklists, due to perceived threats to their autonomy in the operating room. 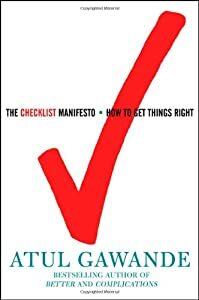 Checklists by their very nature require everyone in the operating room to speak up; the concept of surgeon as ‘Captain of the Ship’ gives way to teamwork and forced discipline. According to Dr. Gawande, only 25% of American hospitals now embrace the checklist as their way of doing business in the operating room. This simple concept belongs throughout the healthcare system: highly complex clinical areas, from the emergency room to the intensive care units often leave critical steps to chance. Without a checklist, the patient is at the mercy of the memory of the caregiver in front of them. And don’t believe for a second that the electronic medical record is a backup; it only knows what it’s programmed to know. You need a team of people willing to speak out and speak up for the patient, asking and answering that each critical step was checked and completed. Pretty basic stuff really, but it requires healthcare providers to change some time–honored traditions. Maybe this is what it means to be accountable; putting a list in the hands of a caregiver and expect that each critical step is checked off. Watching those two pilots certainly gave me a sense we were in good hands. Just knowing that when we got to 10,000 feet they wouldn’t have to turn to each other and ask “Did you close the door?,” made me feel just a little safer.